Fun and Halloween go hand-in-hand. The unique holiday inspires you to get creative, whip up a costume for yourself and your kids, and morph into someone else for the evening. It's an opportunity for the neighborhood to enjoy a night of good cheer, "guess who's behind the mask," and treats for the kids, all while sharing community spirit. Halloween is a favorite among children and the young-at-heart. But what about your pets? Between the chocolate, the decorations, and the startling sound of the doorbell, keeping your dog or cat safe and happy on Halloween can be a challenge. But with some planning, every family member can enjoy a ghoulishly delightful evening. 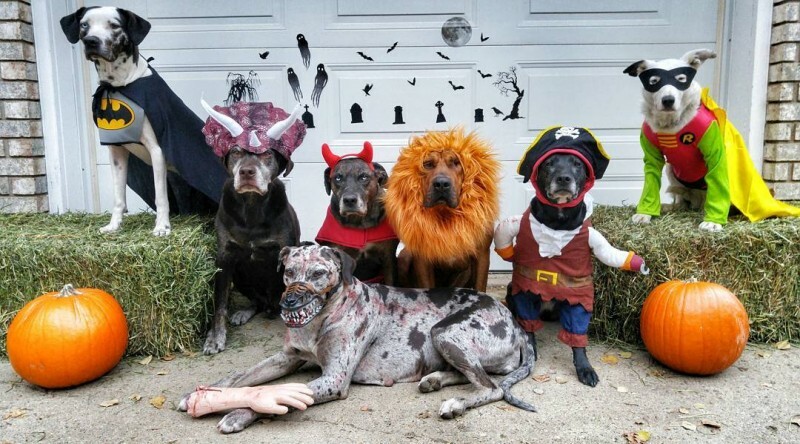 Your dog's temperament, training, age, and health will determine how he'll spend Halloween. If he's a social butterfly and not easily spooked, he may be going out trick-or-treating with you and the kids. Dressing him up in a costume is not preferable for many dogs, but if he loves showing off, make sure he's in a pet-safe costume with no obstructing parts around his neck or limbs. Otherwise, skip the Black Knight get-up or Superman cape. Avoid masks of any kind, as they obscure a dog's eyesight. Just being himself on Halloween is enough. Before you leave the house, make sure your dog is wearing his collar with full I.D. and keep him on a 6-foot leash. You might also want to use a glow-in-the-dark collar so your dog is nice and visible in the dark. As you make the rounds, be careful your dog doesn't pick up any candy and wrappers along your route. Keep in mind that chocolate, artificial sweeteners, and raisins are all toxic to dogs, and that wrappers are choking hazards. If your dog tends to get stressed or or fearful, it should not be unexpected on a night when lawns turn into creepy graveyards, and scary witches and demons lurk everywhere. Be alert for signs of aggression, such as a straightened, stiff tail, which may or may not have a slow, stiff wag. If he is getting stressed, it may be wise to have a family member take him home. If your dog is spending the night at home, the constant ringing of the doorbell may upset him. Likewise, seeing the Grim Reaper and Batman when you open the door could freak him out. With this in mind, designate a quiet area in the house, behind a closed door where he can chill out. Alternatively, baby gates and pet gates are a great option if your dog likes all the hullabaloo, but needs to be contained away from the front door. This also prevents him from dashing out the open door. Little trick-or-treaters are adorable, and you love greeting them and handing out goodies. 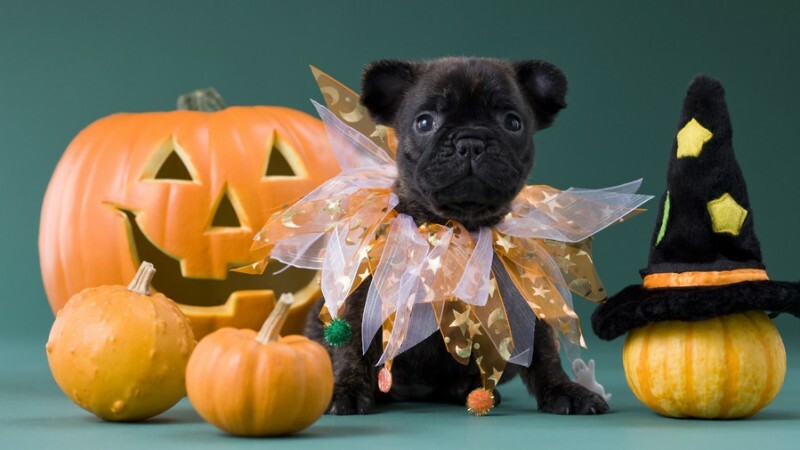 But if you have a nervous dog who's not enjoying the Halloween ritual, let a family member take over host duties while you spend some quality time with your dog. Divert his attention from strange noises with a new chew toy, puzzle game, home-baked treat, or a peanut butter and banana CBD-oil cookie to calm and soothe him. Cuddle on the sofa watching pet TV. You can make Halloween a special evening of bonding with your furry best friend, and it won't be so haunting for him. There's only one way you can keep your cat safe on Halloween: keep her indoors. Cats are safer indoors at any time of the year, but it's especially crucial on Halloween, when people of all ages tend to get rowdy. Most cats are easily spooked, and a cat with outdoor access could run away in an attempt to escape the chaos. 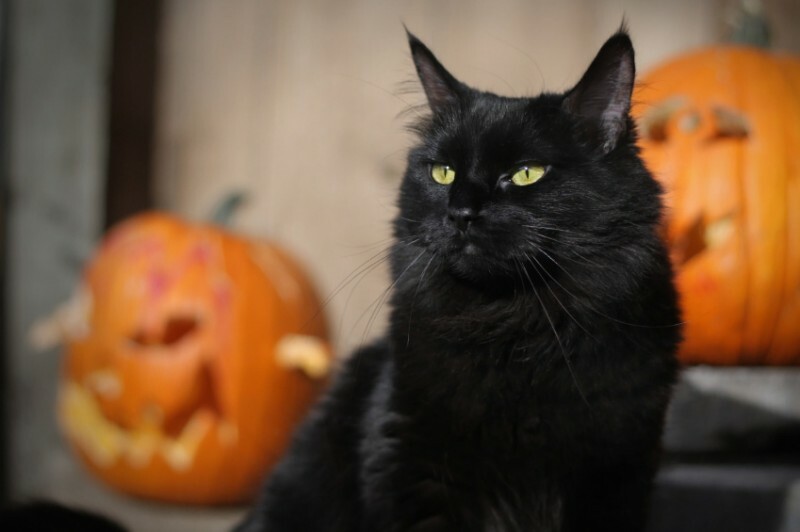 Additionally, some cruel pranksters may prey on cats—especially black cats, who have a long history of superstition behind them—on Halloween. For these reasons (plus a host of others that apply year-round), your cat is much better off being kept inside on Halloween. Like dogs, cats can't eat chocolate. Chocolate contains theobromine and caffeine, both of which are harmful to cats. That said, cats are generally much less likely than dogs to tear open a bag of Milky Ways. But if you have a cat who's especially fond of "people food," be sure to keep any chocolate treats well out of their reach. It's easy to keep your cat happy on Halloween. Safely ensconced indoors, curled up in her cozy bed, she'll likely choose to snooze. If she's the nervous type and is aware of all the festive goings-on at the front door, take her to a room far from the action, and snuggle with her. Depending on the type of neighborhood you live in, your door might be open for much of Halloween night. Ensuring that your pets are elsewhere in the home, behind closed doors, and without access to candy or decorations is the most important tip for giving your pet a safe and happy Halloween. Unless, of course, you have the type of dog that loves wearing costumes and being part of the action, in which case, welcome him to join in on the fun.